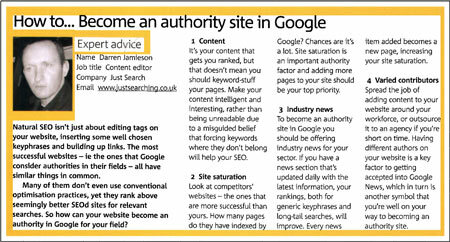 Far be it for me to boast, but I’m in this month’s issue of .Net Magazine with an interview about how to make your website an authority site within Google. It’s quite a good read, if you’re interested in that sort of thing. The golden rule is content, content and more content. It’s one of the reasons that this website ranks for so many different phrases and gets traffic for the most unlikely of search terms. If you write about it, they will come (simply building it is no longer effective enough). Anyway, you can see the magazine on the .Net website here. You can read more tips like this at Just Search’s website, which features a daily blog about SEO and Internet Marketing.